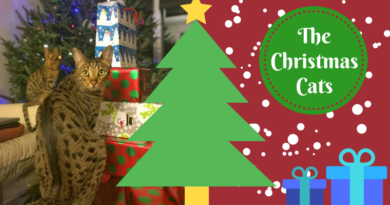 Whether you’re getting ready to bring home a new kitten or you’re looking to revamp your current collection of cat stuff, we’ve got the list of must-have cat products for that special kitty in your life. So after you’ve got the litterbox and cat food picked out it’s time to move on to the fun stuff. We’ll cover all the bases from Playtime to Bedtime. Save the couch. Save the carpet. 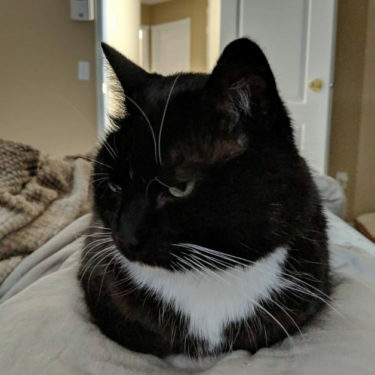 Don’t mess around with one of those awful carpeted scratching posts or throw-away cardboard scratchers you’ll find at the pet store. The price might be enticing, but they’ll cause more of a headache and mess than they’re worth. 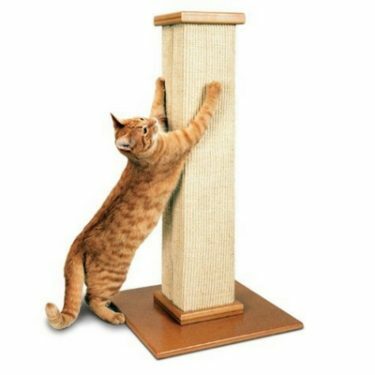 A quality scratching post is the best thing you can get for your cat and your home, aside from a litterbox. 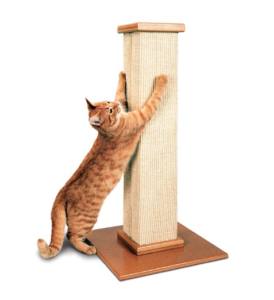 When it comes to quality, durability, and functionality, The SmartCat Ultimate Scratching Post cannot be beat. 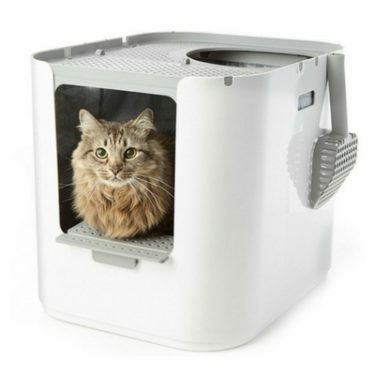 At $40 – $50, this might seem like too much to pay for something that is meant to get destroyed by your cat. But think of it more like an investment in the life of your furniture. And trust us, it is worth the investment! 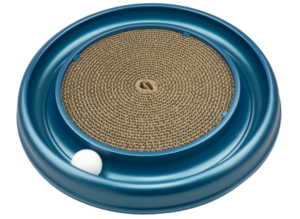 If you’re still not convinced, check out our full review the Smartcat Ultimate Scratching Post. 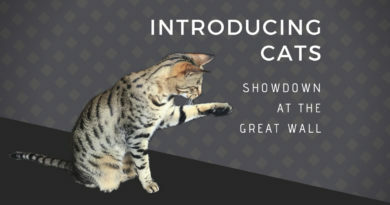 Or head over to our Scratching Post Top Picks page to see how it stacks up against the competition. So we know that water is essential for cats, but do you really need to have an automatic water fountain? If you’re diligent about changing your cat’s water dish every day and your cat doesn’t have any issues drinking from it, then No, a water fountain isn’t necessary. But most cats refuse to drink water that’s been sitting around in a dish. They much prefer running water, like from your faucet. And since cats don’t typically get enough water from their diets, we highly recommend getting a fountain to entice them to drink more. 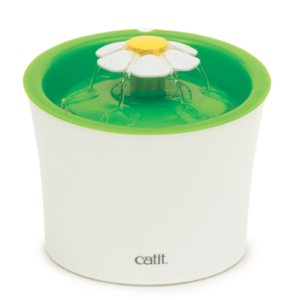 The Catit Flower Fountain gets the job done and looks good at the same time. This adorable cat fountain is a cat pleaser and people pleaser. 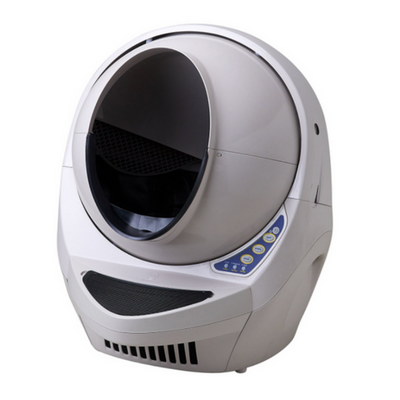 For more top picks in pet fountains click here. Give your cat a piece of furniture they can call their own. A good cat tree provides spots for lounging, scratching, and observing from a heightened vantage point. 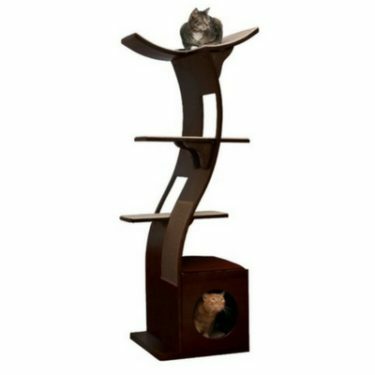 Since this is likely one the priciest investments you will make for your cat, we recommend reading our Cat Tree Buying Guide. 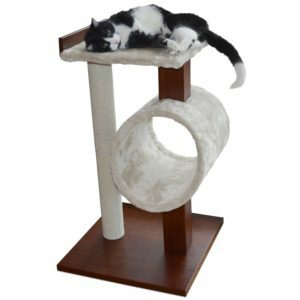 Thanks to the PetFusion Modern Cat Tree, cat owners now have an affordable and attractive alternative to those hideous carpeted cat trees. 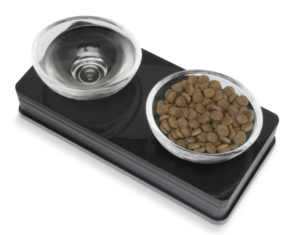 For such a seemingly simple product, finding the right cat bowl can be more difficult than you’d think. It has to be sturdy enough that it won’t get knocked over or slid across the floor. It has to be the right size and height for your cat. And it has to be easy to clean. The Catit double diner hits the mark. This double feeder is attractive and very functional. We particularly like the rounded bowls that minimize food waste. 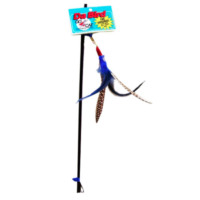 Let the birds entertain your cat while you’re at work. Most domestic cats love looking out windows, especially if there’s a good view of wildlife. 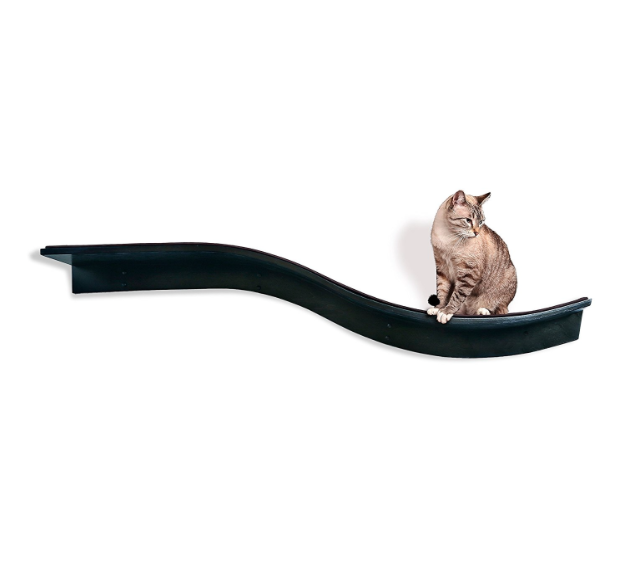 If your windowsill is too narrow for your cat to perch on, consider getting them a Kitty Sill. K&H Manufacturing makes several models, but this one is our favorite. There are so many cat brushes on the market it can be overwhelming deciding which one to get. From experience, just because a cat brush is designed to remove tons of hair doesn’t mean it’ll work for your kitty. An often overlooked component of a good cat brush is whether or not your cat will like it. 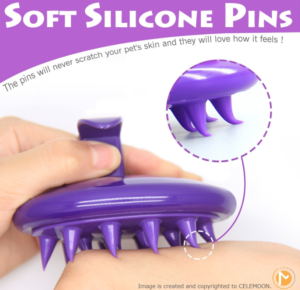 Our fussy cats have approved of the CELEMOON Silicone Cat Brush. 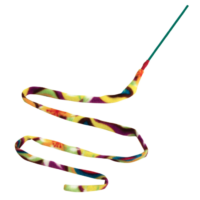 The flexible material makes for a pain-free grooming experience. And although it doesn’t look like it would be great at collecting hair, it works wonders. 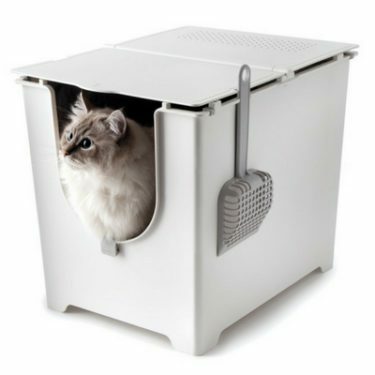 Even if you have an enclosed litter box, your cat will manage to get litter outside of the box and all over your house. For years I just accepted this as an unfortunate outcome of having cats. 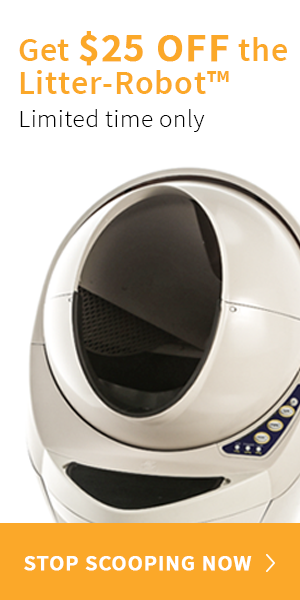 But pet product manufacturers have answered our calls for help and come up with a nifty mat that traps kitty litter and is easy to clean. 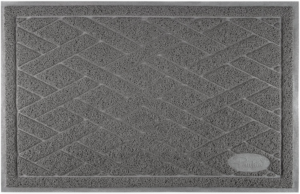 There are a number of these types of mats on the market. 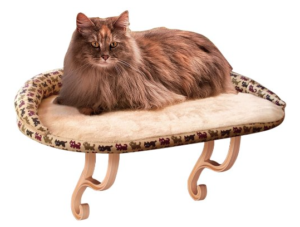 Our favorite is the Pawkin Cat Litter Mat because of its large size and affordable price. Playtime is essential for domestic cats. It’s good for their physical and mental health. The best type of playtime involves human interaction. Interactive Wand Toys are the best types of toys for cat engagement. Playing with your cat will also improve the bond between owner and cat. 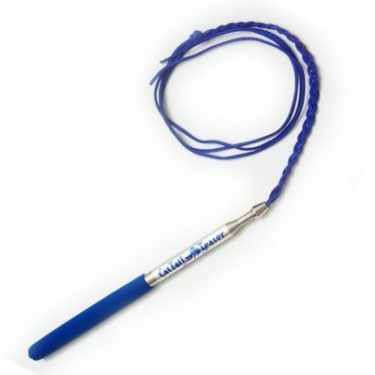 The top 3 wand toys that we’ve tested and our cats have approved of are Da Bird, The Cat Charmer, and the Leather Bouncer Toy. We keep all 3 in the playtime rotation so our cats don’t get bored. 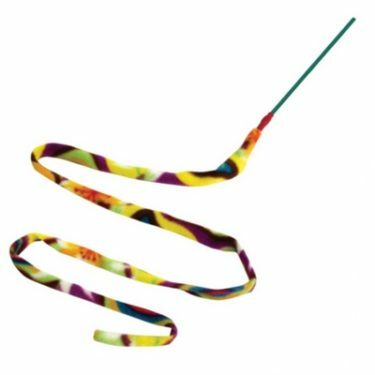 In addition to the interactive wand toys, you’ll also need to have some toys to keep kitty entertained when you’re not home. 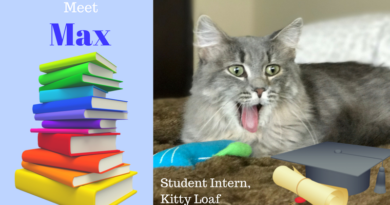 Take our word for it; a bored kitty is a bad kitty. These toys should be safe and fun. 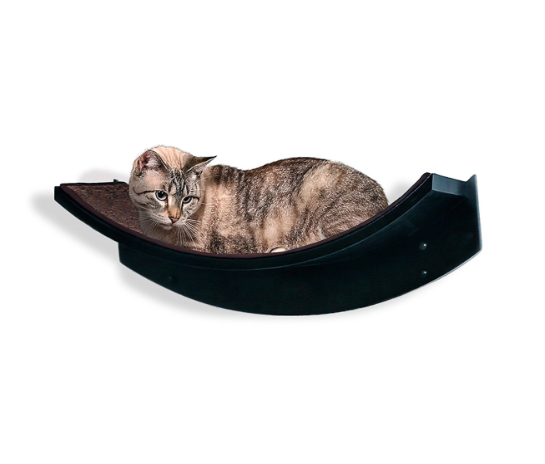 The Bergan Turbo Scratcher is a great toy because it provides both entertainment for your cat and has a built-in (replaceable) scratching pad. 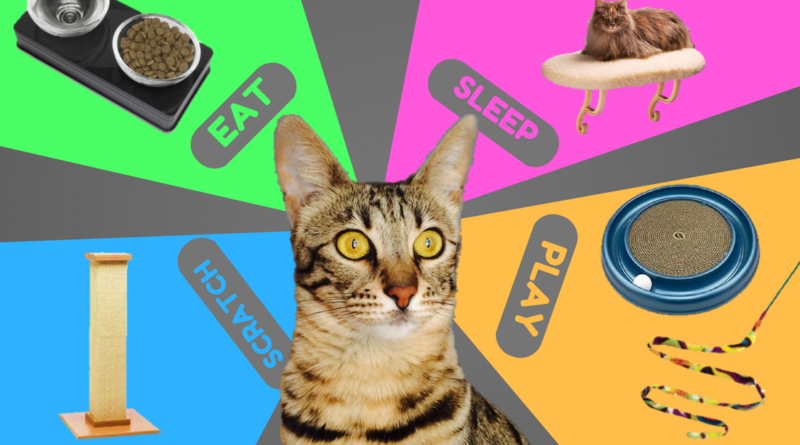 A word of warning to the novice cat owner – Not all catnip toys are created equally and most of them on the market can pose serious health risks if your cat eats them. Avoid the little mice with eyes and tails that’ll easily get ripped off. Avoid stuffed toys altogether. 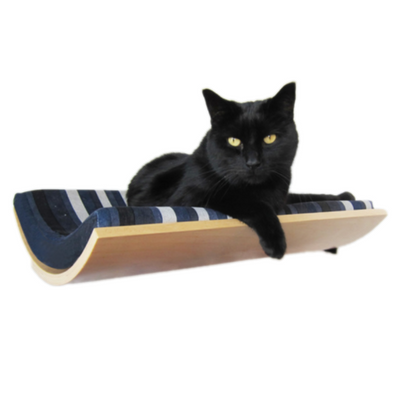 We recommend the KONG refillable critters or Skineeez for cats. 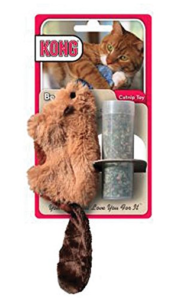 The KONG Catnip Beaver is a durable little critter that comes with a tube of catnip. Our cats carry this toy around (and leave it by the front door) like it is prey. Check out the full review here.